The first is Dire Boar. Like its common relative the wild boar (Sus scrofa) dire boar lives in forested areas. Unlike its cousin, however, it preys on unsuspecting adventurers smaller organisms. 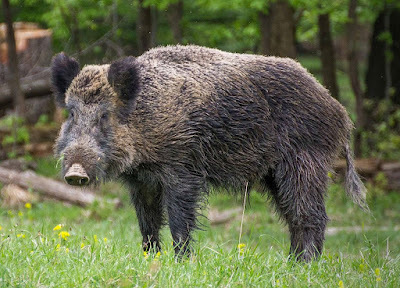 Whereas a wild boar is shy, invisible, noiseless as a proper forest animal (other than a hedgehog) should be, a dire boar relishes making its prey terrified before its attack. This aspect of fear is the most important difference for a lay person. A wild boar is a big pig. Just a pig. A provider of ham and gruesome looking wall trophies reminiscent of Jaghut. 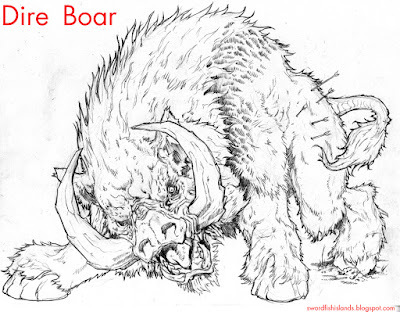 A dire boar is anything but. It scares you. It terrifies you when you're running on a forest trail, unarmoured and unarmed, and your fellow adventurers are nowhere in sight. A dire boar is particularly aggressive when it is guarding its young. Though these are very cute (they beat My Little Pony by furlongs), their presence is another factor contributing to your "We're doomed!" disposition unless you can teleport. Suppose you manage to escape the dire boar, but you had planned to run two laps in the now dire-boar infested territory. You could stick to just one circuit, and give in to the putative threat of another dire boar encounter. However, you realise you're now facing another phenomenon, somewhat similar to The Call of Cthulhu: it is Dread. Veteran gamers runners know it well: your legs feel weak, and the very thought of doing something sounds implausible. Recall the Frodo Baggins feeling of helplessness when faced with the Nazgûl. But there is no Glorfindel, Gandalf or Strider around. Your very being feels like not going for another lap. Overcoming dread whilst running over 20k is energy draining but rewarding, though. You (should) feel much better for it afterwards, as it added additional challenge (and bonus XP as well?). Provided that the boar does not get you when you cross its territory again.